What if verifiable income exceeds that required? I have a retirement Visa and have lived here in Thailand for 14 years. My basic retirement income (Social Security) exceeds the 800,000 baht requirement under the new Thai Immigration rules. The new rules (see below) state that one must have (3) evidence of income no less than 65,000 baht, or (4) 800,000 in a Thai bank, or, (5) a combination of income and money in the bank that totals 800,000 baht. The "or" word is critical here! The "or" to me means that if you don't have (3), then you must have (4) or (5); If you don't have (4), then you must have (5). So, if I meet the requirement of (3) and have verifiable income of over 65,000 baht per month, why would that alone not qualify for the retirement visa renewal? 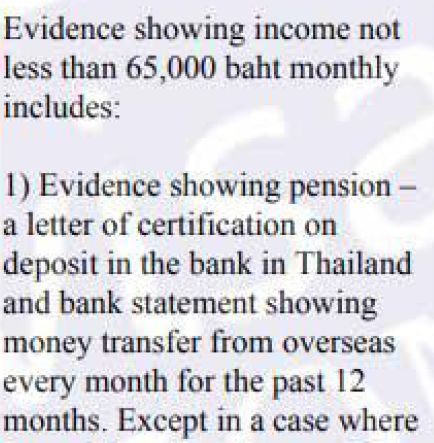 Item (3) says nothing about having to have this income in a Thai bank. My Social Security is Direct Deposited each month to my Bank of America account in the U.S. Nevertheless, I still transfer from Bank of America each month most of the income I receive to Bangkok Bank as means for my support. Anyone else have this situation? Your thoughts and comments regarding my logic about this are appreciated. (5) Must have an annual earning and fund deposited with a commercial bank in Thailand totaling no less than THB 800,000 until the filing date. The said fund must remain in the account prior to and after the permission is granted and the alien can make a withdrawal under the same conditions as stated in (4). How are you going to prove your income? If you can get an "income letter" from you embassy, that will suffice and don't need to deposit any money in a Thai bank. But oops, you cant' I think, hence, monthly transfer in a Thai bank from oversees. The previous rules have not changed as far as what the basic requirements are. Everything is a or statement meaning you only need one of the 3 options. That is the same as it has been for years. For income it was changed by doing an amendment to the police order for the documents required. No, as I read it, the rule says you must have verifiable income of no less than 65,000 baht -- then it goes on to say, after "or", what you must have if you don't have income of no less than 65,000 baht. Rule says nothing about having to have the income placed into a Thai bank. As to verification, I have a letter from the U.S. Social Security Department that shows what my monthly income is. Keyword here is verifiable,i do not believe the Thai immigration office will accept that.That is where the letter from the embassy came in and that is no longer an option. Please see what Ubonjoe posted,he knows his stuff. Rule says nothing about having to have the income placed into a Thai bank. As to verification, I have a letter from the U.S. Social Security Department that shows what my monthly income is. Sorry, but IM will not accept a SS or pension letter without an Embassy income affidavit. You will need to transfer the 65k into a Thai bank for proof of income. Best to ask Ubonjoe... I feel sorry for him having to answer the same question over and over again for the next several months. Depends on which immigration office you are dealing with, they all make up their own interpretation of the rules. Do you know of and have 1st hand knowledge of any IM offices that are accepting SS letters as proof of income without monthly transfers into Thai bank? If so, kindly share which ones. Do you know of and have 1st hand knowledge of any IM offices that are accepting SS letters as proof of income? Or, is above just your opinion? First question, no. "is above just your opinion?" Not an opinion, fact. How long have you lived in Thailand? Don't you know that banks, government offices, Immigration offices etc, all make up a lot of their own rules? Where is the proof to support your so called fact? I know how to answer that but I won't. I will ask you again though. Assuming you live in Thailand, how long has that been for?